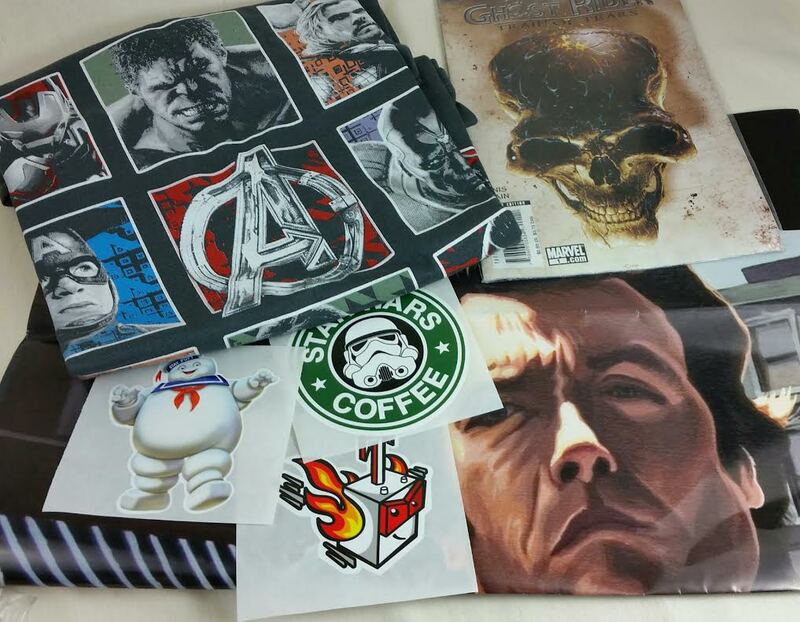 TeeBlox: The Best Monthly Geek and Gamer T-Shirt Subscription Ever! Plus a 15% Off Coupon Code! TeeBlox is a super awesome t-shirt subscription that sends you 100% authentic licensed geek and gamer shirts every single month! Not only that but you also get a couple other goodies tossed in. And it's the BEST price ever! Only $9.99/month! That's so worth it I'm thinking of subscribing twice. Once for me and once for my husband. Did I say licensed? Let me say it again. Licensed. Boom. I was NOT expecting so much in that packet and I'm happy. I thought it was just going to be a t-shirt. No. It's more! Once you sign up you'll be asked the all important question. What kind of T-shirts do you want? That's right, you get to pick your poison. You can choose Games, Movies & TV Shows, Beers & Liquors or you can do what I did and get the "Hot Meex" for a little of all-of-the-above! 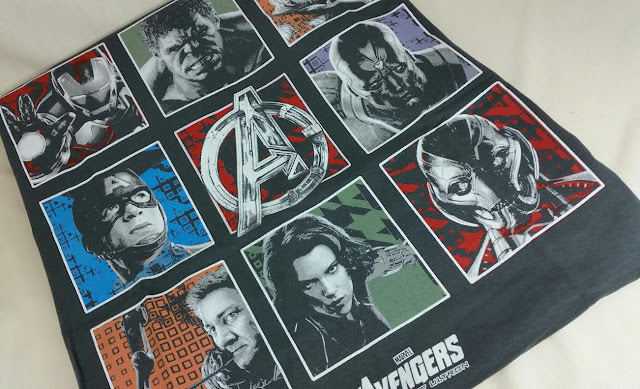 We received a licensed Marvel Avengers t-shirt. It's a nice thick cotton. 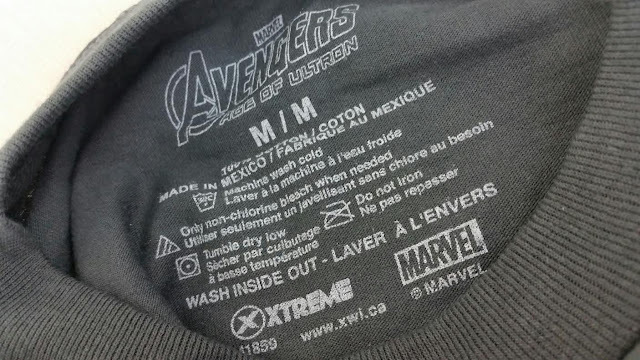 Not that super thin fabric that you can practically see though. DH is pretty happy with it. I was hoping he wouldn't like it so I could steal it from him. Oh, well. I probably will need my own subscription. Here's all the technical info. Don't iron the silk screen, basically. And *cough* licensed. I don't know. Maybe that's not a big deal for some people. And really, it isn't. But sometimes I don't want a mashup of one of my favorite games. I want something straight from the game. Maybe that's just me. But if I'm going to get an Assassin's Creed t-shirt I don't want a mashed up Mario's Creed. Anyway, on to the other stuff! This is actually pretty cool. It's so huge I couldn't get a picture of the whole thing but it's a Clint Eastwood street scene from Dirty Harry. It has a caption of "Feeling lucky Punk?" 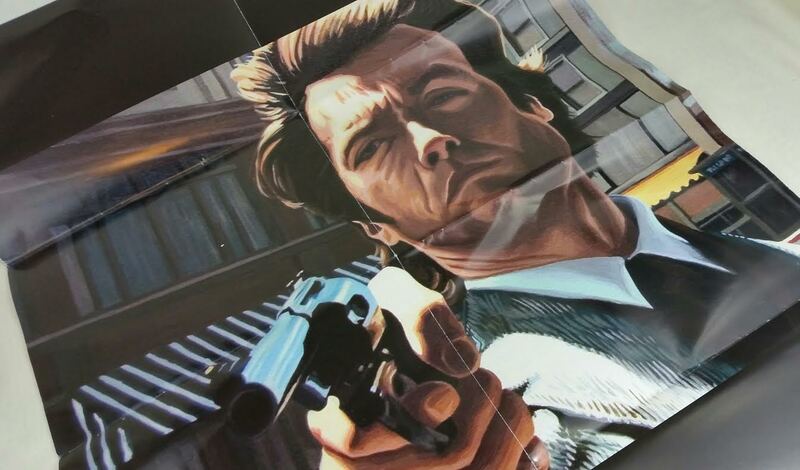 I don't know if I've watched Dirty Harry but my husband said I need to get a frame for it. I think the folds are a little prominent but it's still fun. They said you'll get two extras with your t-shirt and I'm guessing this is the second one. 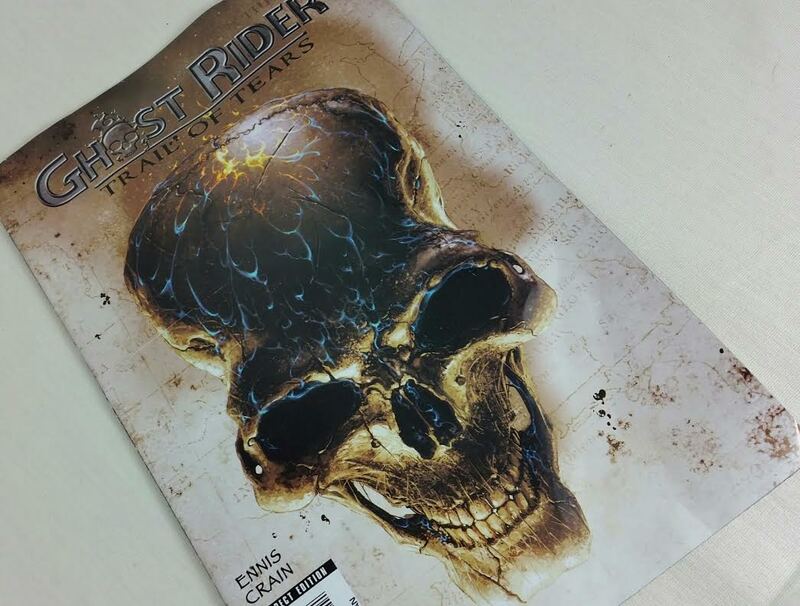 It's a Ghost Rider Trail of Tears comic book. I'm not really big into comic books and it seems like this one had a lot of ad pages in it but maybe that's normal. 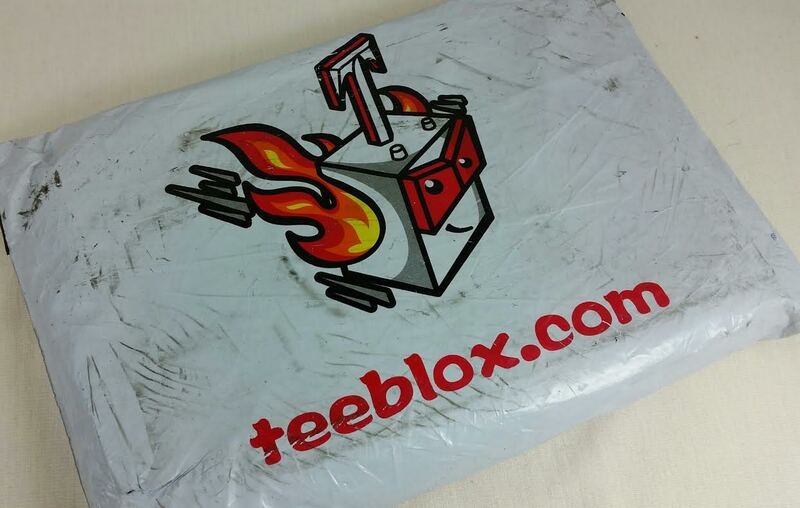 If you would like to sign up for TeeBlox, you totally should!! Use BITSNBOXES to get 15% off your first month! There's really no reason not to sign up. These are nice t-shirts. $10 is basically like getting them free. In my opinion. Use code BNBTBX for free shipping on your first month (that saves you $2.99)! *This box was sent complimentary for review purposes. However all opinions are unadulteratedly mine. Which means, if it wasn't sent to me, I'd be paying for it. And in fact, I'm pretty sure I will be because I want my own t-shirts and $10 is srsly worth it. Fun box, and I love the price. 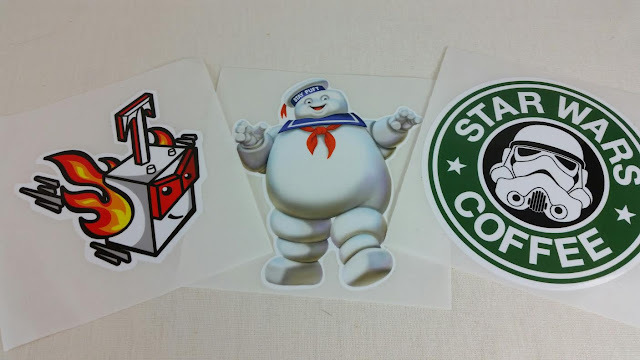 :) I ordered the TV/ Movie one. Thank you for the coupon code. I remember when Clint Eastwood was one of the hottest men in Hollywood. That was a very long time ago, even for me- ha. Clint Eastwood has always been a good looking man. :D Enjoy your t-shirts! !